Browse the list below for all Wrox Blox titles related to SQL Server applications. Here's where you will find the most up-to-date technical expertise on a wide variety of SQL Server and related topics, including scripting SQL management objects (SMO), Windows PowerShell, database administration (DBA), and more. 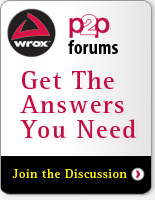 You can count on Wrox Blox to help build your SQL Server knowledge, today!